Check any list of ‘great men’ of the 20th Century and you’re sure to find Winston Churchill ranked near the top. 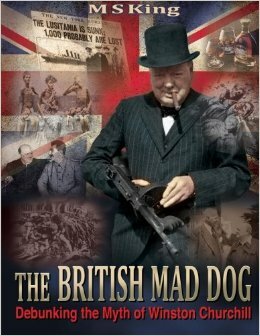 It was the courage, the strength, the indomitable will and the inspirational oratory of ‘The British Bull Dog’ - we are told - that saved Britain and the ‘free world’ from capitulating to Hitler. For such noble attributes and deeds, statues of ‘Sir Winston’ stand all over England, and even in Canada, the USA and continental Europe. Countless schools bear his name, as do parks, towns, squares, highways, streets, tanks, submarines, ships, mountain ranges, trust funds and even cigars. More than just a great statesman, Churchill was – the court-historians assure us – a literary giant as well. His numerous historical works made him one of the most prolific writers ever to serve as head of state. There is one wee-little problem with this flattering historical narrative of Churchill -- it is false! And by false, author M S King doesn’t merely mean to say embellished, exaggerated or incomplete. No, the entire tale is a monstrous lie originally engineered to conceal the foul deeds of a deranged warmonger, and perpetuated out of ignorance and academic arrogance. In ‘The British Mad Dog’, King draws heavily upon ‘mainstream’ sources to strip bare the phony facade of this vilest of charlatans. The surgical precision with which Churchill is cut down to size will radically change not only your view of the man, but also of the fake world in which we live in. http://www.redicecreations.com/radio/2016/04/RIR-160413.php We begin with a look into the English blueblood family that was prominent in high society and politics for 250 years before the man championed as “The British Bulldog” was produced. Mike touches on Churchill’s early upbringing in military boarding schools as the son of an abusive, distant father and NYC socialite mother, and grandson of the “King of Wall Street.” We learn about his years as a highly paid English war correspondent, entry into British parliament, and his swift appointment on the eve of the great war as the First Lord of the British Admiralty. Then, Mike explains Churchill’s role in the German hunger blockade of WWI, a key point when it became clear he was playing in the globalist Zionist game. He characterizes the reckless and psychopathic behavior that Churchill became known for, most notably his perpetual drunkenness and indebtedness, poor political strategies, his part in the catastrophic 1926 crash of the British economy, and a callous disregard for human life. Mike also covers the “Wilderness Years,” when Churchill was banished from politics, and his return to power that was financed by the same Jewish billionaires who were angling for a war with Germany.